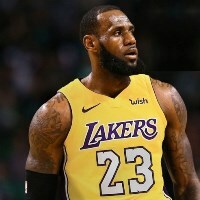 The Los Angeles Lakers made the biggest move of the offseason by signing LeBron James to a four-year $154 million deal. Although this is a move that will most likely take the Lakers back to the playoffs for the first time since 2012-13, it’s unlikely that they will be able to compete yet for the NBA championship as they are a work in progress. Rajon Rondo at point guard, Kentavious Caldwell Pope at shooting guard, Brandon Ingram at small forward, of course, James would start at power forward, and JaVale McGee at center. Lonzo Ball, Josh Hart, Lance Stephenson, Michael Beasley and Kyle Kuzma would see a lot of action off the bench; while the minutes of Ivica Zubac and Moritz Wagner on the court would depend on the matchups the Lakers face. Kuzma would no longer be a starter but he would still get a lot of minutes at the power forward position as he will help keep James fresh throughout the games. Other than James the Lakers lack superstar-caliber players, but they have lots of depth as several of their players on their second unit could play a starting role if needed. This is, of course, a good problem to have as having so much depth will help head coach Luke Walton keep his players fresh for the playoffs. At point guard, it will be interesting how much Lonzo Ball managed to improve his game over the summer (especially his shooting). Ball had the time to work on his game, but if he fails to show enough improvement before the season starts Walton will not hesitate in naming Rondo the starter. Rondo is still a great distributor and a solid starting point guard who has really extended his range over the past few seasons and last season he shot 33.3 percent from three-point range during the regular season with the Pelicans and over 42 percent in the playoffs. Rondo should help spread the floor and with his passing, he will be a great distributor for the Lakers next to LeBron in the starting lineup. He will provide the Lakers with playoff experience and a steady hand while proving to be a great mentor for Lonzo Ball. If as expected Lonzo Ball ends coming off the bench he will still see a lot of minutes and could at times even play next to Rondo. Although both guys will split minutes at point guard, Lonzo could sometimes play at the two position if he shows he’s markedly improved his shooting. KCP will most likely start over Josh Hart as he proved last year that he’s a solid shooter and defender that will benefit from playing next to James as he is likely to get a lot of open looks. McGee will likely be the starting center and have a role similar to the one he had with the Warriors. He’ll likely play around 20 minutes per game and become the Lakers shot-blocking center and a guy who can score easy buckets in the paint as James draws most of the defenders’ attention. With all these pieces in place, James is set to lead the Lakers back to the playoffs as he gives the Lakers a go-to scorer, playmaker, and leader. James can really help grooming the young guys on the team, especially Brandon Ingram as they both play the same position. Despite the growth that the Lakers younger guys should show, this team isn’t likely to contend for the title in the deep Western Conference where the Golden State Warriors, and Houston Rockets are in a class by themselves. Although the Lakers have the potential to win 50 games, they will have a tough time reaching the Western Conference finals or advancing past them, however, it wouldn’t be far-fetched to see them reaching the conference semifinals.